Grains mixed overnight. Corn down a penny, wheat and beans up a penny. With Republicans retain control of the Senate, some feel that tax cuts that helped the economy will stay in place. However, new legislation may be slow to be passed in a divided Congress, but an infrastructure bill and a middle-class tax cut cold be possible. Some also feel that a divided Congress could slow U.S. economy and could reduce the number of Fed interest rate increases in 2019. The U.S. Southern Plains weather will be dry until a system brings snows to northern Kansas and light rains to southern Kansas and most of Oklahoma, Texas by Thursday. 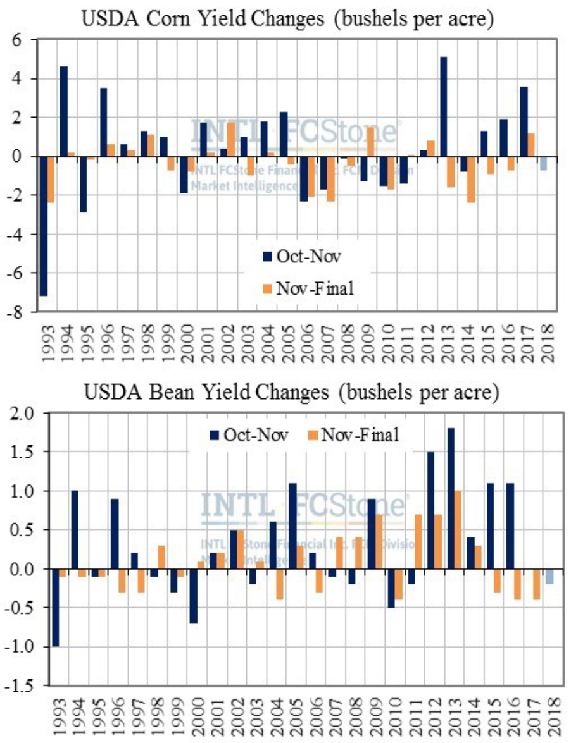 USDA WASDE Report out tomorrow at 11 a.m.
Today’s charts show USDA corn and soybean yield changes from both October to November and November to “final” - not necessarily the January report - since 1993. A reduction in both corn and soybean yields this month, if realized, would be the first instance of that since 2011, with beans showing zero Nov losses since then and corn showing only one (in 2014). Conversely, corn yields have gone down from Nov-Jan in four of the last five years, with soybeans down in each of the last three (-0.3 to –0.4 bpa each).